Isabel Lee | Malaysian Beauty & Lifestyle Blogger: Pop&pose All the Way to Japan and Bali! 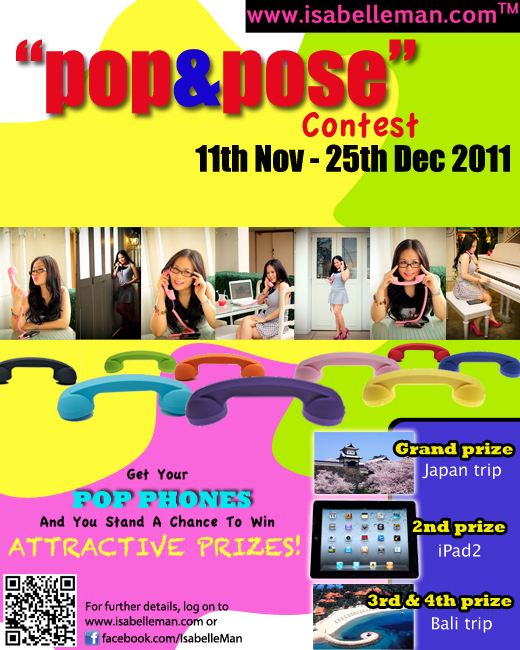 Pop&pose All the Way to Japan and Bali! 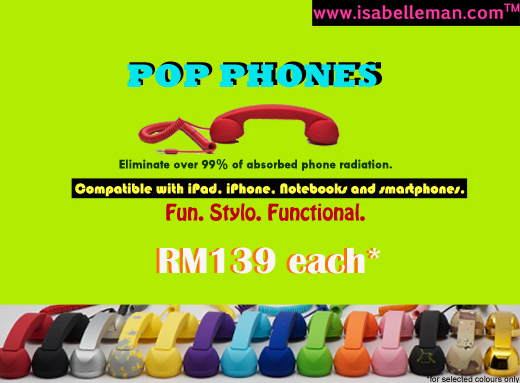 Then I somehow stumbled upon isabelleman.com while browsing in Facebook and discovered that.. That lil phone attached to his handphone is actually a Native Union Pop Retro Headset aka Pop Phone. 1) You are all probably aware of the news/rumours about our handphones emitting harmful waves. This pop phone can eliminate over 99% of absorbed phone radiation! 2) You know that feeling when you're talking to your best friend on the phone and you just 'kiap' your phone between your shoulder and ear? Then your hands are free to do other stuff. Now, I can't do that anymore with my handphone as it's too slim. I'm afraid it'll slip and drop. Also, there's just something more satisfying about the former. 3) No more oily cheek/sweat strain on your phone! I dislike answering the phone on hot days when I'm out as my phone screen will be wet after that from the sweat & oil on my face. Eww.. It's worse if you lent your phone to someone else and get it back with a wet spot! Yuck..
4) Don't have to strain your neck if you answer the phone while charging it. My charger's wire runs behind a table so if I wanna be on the phone, I need to be near the charger. If I have this, it can act as an 'extension' so I can lie comfortable on my bed and chat the night away. 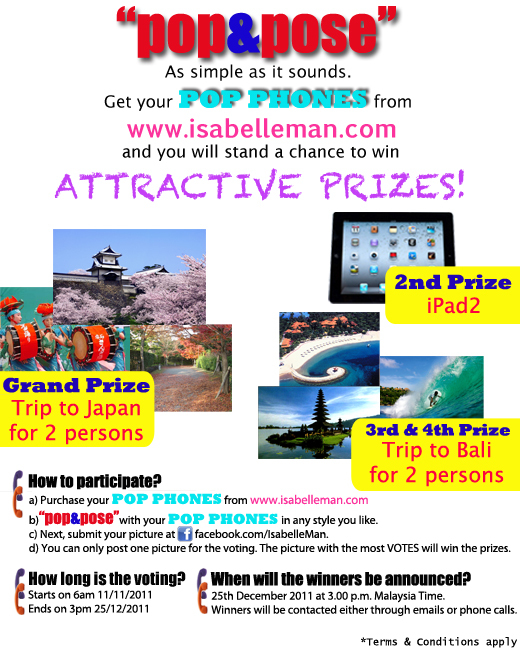 7) You could win trips to Japan, Bali or an iPad2! How does this work? Honestly, I think the 3rd & 4th prizes are better than the 2nd prize hahaha! So you must plan your votes strategically to aim for the prize you want =P Currently I only see a handful of people participating so chances are high! But actually purple is nice also. And matches my current phone casing. Anyway, you can check out the other colours and more photos HERE or visit their FB page HERE. ooo i have never heard of these before. maybe i should check them out! thanks for sharing! i never heard from it before too! i think i need one! so i can "gayut" hours!